They say the only bit of difference that separates the East from the West is spirituality. You can achieve all that you want and scale mountains of success but no achievement can be rendered as real and authentic unless you have discovered yourself. That said, the West does come with its fair share of burdens in the form of expectations, unruly lifestyles and it isn’t uncommon to hear people ‘completely losing the plot of their lives’ once they become spiritually hollow. But at the same time, many a Western celeb have found in India a spiritual or higher calling and have re-sought themselves to begin afresh. Some have aced heights of fame and we still don’t know who these bright stars are. Let’s take a look at some Western celebrities who you probably may not have thought of having a special India connection. She’s known to be a dainty beauty goddess who can teach boys into becoming men. Steaming hot, charming and having a career star-studded with hit flicks such as Pulp Fiction, Kill Bill, Gattaca, Batman and Robin, there’s never a dull moment with Uma Thurman around. But here’s a fascinating factoid about the starlet that perhaps many of you wouldn’t have known! Uma’s middle name is Karuna, meaning mercy and compassion, translating from Hindi. Her family, for long has had keen interest in understanding the depths of Hinduism and Buddhism and it is believed her father, a professor of Indo- Tibetan Buddhist studies named Uma after the Hindu goddess of compassion or kindness. Back in the sixties, in Great Britain as in the rest of the world, these frizzy haired Liverpool boys became a global sensation and plundered a heady mix of billboard smashing record hits. Famous for “All you need is love”, ” Love me do”, “Mother Mary”, “Yellow Submarine”, “Yesterday” and many more sensational hits, there was a verve of spirituality in each of the Beatles’ life. In their heyday, around mid sixties, The Beatles navigated toward the spiritual East, in the heartland of India to soak under the layer of spirituality and consciousness in order to re-group and re-discover themselves. 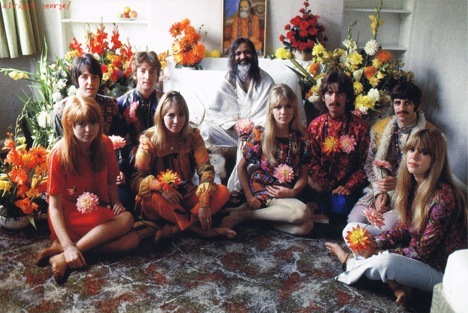 The enchantingly beautiful group of Ringo Starr, Paul McCartney, John Lennon and George Harrison visited Rishikesh and took tutelage under the spiritual guidance of Maharishi Mahesh Yogi. But as they puffed away some divine melodies amidst the breathtakingly beautiful landscape of the Himalayas, there love with India was torn thanks to a quick fallout with their guru. But, fresh from their spiritual voyage in a country less polluted by the drug mixed alcohol binges of the West, they resumed their musical career in England and were back to recreate musical melodies, thanking their stint in India. Here’s a veteran of around 100 documentary/commercial/ art-house movies, who made a name for himself as an intense actor capable of pulling off very versatile roles. His looming silence speaks louder than a thousand words and when the man born to a Gujarati father and British mother speaks, you can’t help but look at his intense eyes and behold pure magic! Not many know that Ben Kingsley’s actual name is Krishna Pandit Bhanji. And he’s actually a native of Gujarat from his father’s side. 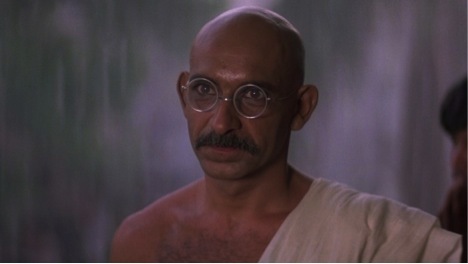 It is no irony then, that the man we respect for playing righteous characters in movies like, “Schindler’s List” actually went down to play a gentleman he comes quite close in resembling: Mahatma Gandhi. But there’s more to Kingsley’s India connection than you would have imagined. In 2007, he did a movie with Aishwarya Rai titled, “The Last Legion”. He has also been conferred with the Padma Shri in 1984 following his masterful acting in “Gandhi”. He’s the man responsible for creating a new wave of sensationalism concerning smartphones and gadgets. Curious, supremely intelligent, compassionate and an original inventor, it can be said the ‘i’ in an iPhone was a daft undertone of Steve Jobs’ drive toward exploring the self. But long back, way before he established Apple, Jobs, as an employee of the video game firm Atari visited India along with a friend Dan Kottke. He spent months traveling across North India from 1974-76 in what many call was his quest for self-discovery. Always mystified by eastern-philosophies, Steve Jobs was a thinking man and an ardent admirer of India. 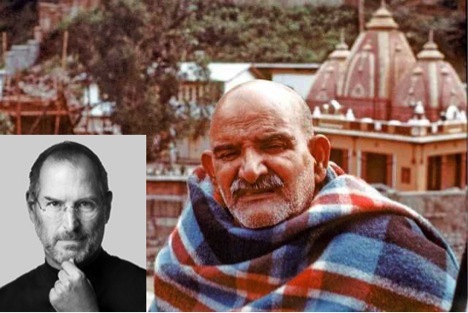 He is also said to have visited the famous Neem Karoli Baba in North India in a bid to reconnect with his spiritual self and consciousness. Many hail Steve’s stint in India as being a big booster in his establishment of the cult brand Apple as we know it today. She’s an upright, scholarly and dynamic US Congresswoman. An astute thinker and a highly respected American of Indian origin, Tulsi Gabbard recently made news after sharing her insights on the Bhagwad Gita. 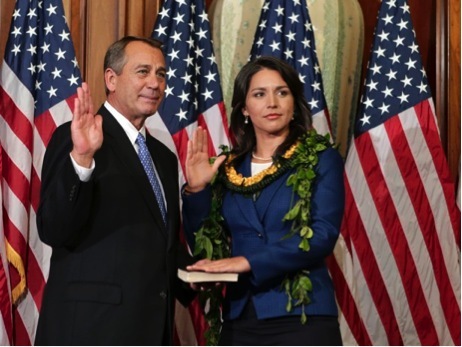 In January 2015, as Tulsi took her oath as a US Congresswoman on the Gita, she revealed, “it is the perfect textbook for those striving to be ‘servant leaders'”. Moved by the teachings of the majestic spiritual text, Tulsi added that the teachings of Lord Krishna on life and its meaning became the foundation of every action she initiated in her life on both, personal and professional front. Tulsi Gabbard’s very vocal appreciation of the Gita ignited a new wave of interest in the US toward the sacred Indian text. Most know her as the hot and desirable former companion of ace author Salman Rushdie. Other’s have fancied her stylish gait on many a red carpet occasion. But among the famous Indians settled in the west, the name of Padma Laxmi echoes familiarity for both style and substance. The 45 year old Chennai born is a successful actress, model, author and television host, most famous for her debut cookbook, “Easy Exotic”. Among the most famous Indians recognized in the west, Padma Laxmi earned worlwide fame back in 1999 when her cookbook won the Gourmand World Cookbook Award. Sever years later, she towered on top in 2010’s Top Chef, a television program that won an Emmy for Outstanding Reality- Competition Program. The Aussies have long fancied India for a number of reasons. Some fall in love with our rustic charm, the others get swayed by the fragrance of traditions and culture. Among the many Australians who have sought in India a home away from home, the name of actress Radha Mitchell stands bright. Most know her just as Radha, but her full name is Radha Rani Amber Indigo Ananda Mitchell. Having a spiritually inclined upbringing, the Melbourne born actress looks up to Lord Krishna as a constant source of inspiration in life. But for Radha, the romance with India can be likened to the game of destiny. Back in 2009, filming “The Waiting City”, Radha got a chance to spend a lot of time in Kolkata and the nature of the story drew her all the more closer to a country that she’s famously hailed as having a sense of belonging and oneness that she can’t find elsewhere. There is only one way to describe this American sweetheart: an acting guru. The shining star of “The Pelican Brief”, the daunting force in ” Eric Brockovich”, the inspirational figure in “Mona Lisa Smile”, Julia Roberts unfurls pure acting charisma and can both sweep you off your feet and make an indelible impression in your movie viewing time at the same time. It is fascinating to note that Roberts commands a peaceful face that glitters a sense of silence that beats the cacophony of the material drama around, if you think about it. And just what can be attributed to Roberts’ charisma? Well, she’s a living yogi swelling in the garb of an actress. Julia Roberts loves India, Hinduism, our culture and what she hails as our ‘unmistakably beautiful fragrances’ that can’t be found anywhere else in India. She’s known to have visited the Mahakumbh mela in her past and ever since shooting sequences for “Eat, Pray and Love”, in India fancied an ephemeral affection with India that has continued to the present day. Many create music, but Carlos Santana creates magic in playing his form of music. He is a soul-stirring musician who you would do well to brand as the century’s greatest musician, ever since Jimmy Hendrix left for heavens. But at his pomp in the 70s, Carlos Santana visited India and sought blessings of Shri Chinmaya who anointed the “Black Magic Woman” star with a spiritually heightened identity, renaming him as “Devadip Carlos Santana”. 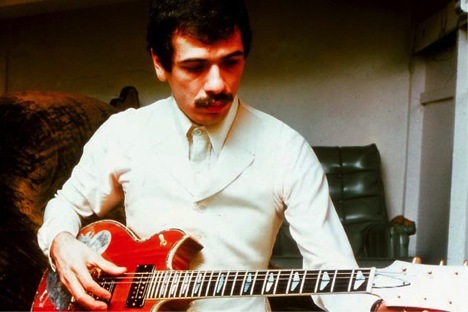 Legend has it that Santana was introduced to Swami Chinmaya by fellow musician and friend, John McLaughlin. Santana was shown a spiritual path that forbade the use of alcohol and drugs and encouraged the music and poetry as expressions of thankfulness to the Divine. And if you fragment Santana’s music into its deeply enchanting layers, you will discover just the above. If you are remotely interested in reading and someone who is fond of tales based on spiritual sojourns or of self-discovery, then chances are you would have heard of a certain Elisabeth Gilbert. Best known for her best-selling novel, “Eat Pray Love”, this New York University graduate enjoyed a beautiful self-exploratory stint in India. Before she wrote her widely acclaimed novel, Gilbert spent three months in India where she traveled, meditated and found her path to spirituality whilst living in a remote village. It is rumored, during this stint the author converted to Hinduism. 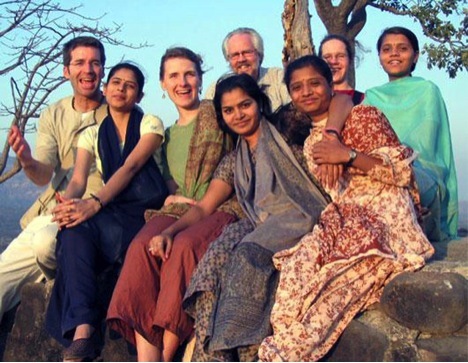 Well, all one can gather is that India holds such a magnetic charm to westerners that you’d rather be here finding yourself in India than being swayed by the madness of the rest of the world.